It's a bird, it's a plane, it's a CubeSat! 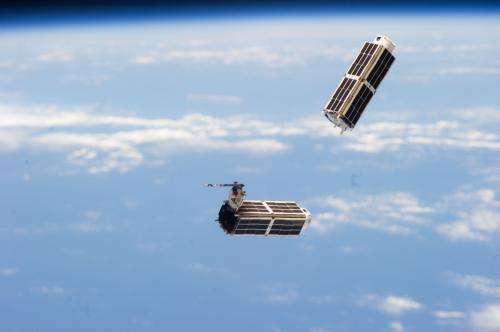 With so many small, relatively inexpensive satellites deploying lately from the International Space Station, it may seem like the area referred to as low-Earth orbit, between 100 and 1,240 miles above the planet, is full of these compact cubes. The miniature satellites, or CubeSats, conduct research and demonstration missions. In the span of several weeks, 33 new CubeSats deployed from the space station. The NanoRacks Smallsat Deployment Program provides commercial access to space, via the space station, for CubeSats to perform Earth and deep space observation. The 28 Dove satellites that make up Planet Labs Flock 1 constellation began deploying in early February. Additional NanoRacks CubeSats released this week. These various CubeSats are conducting Earth observation missions, testing technologies and even tweeting from space! "It's exciting," said NanoRacks CEO Jeffrey Manber. "Our company has been working with NASA and the Center for the Advancement of Science in Space (CASIS) to open the door for commercial pathways to space. This is a really wonderful time for getting into the commercial utilization of space." Commercial opportunities for CubeSats and other research on and off the space station exist through a public-private partnership enabled by Congress in which the U.S. portion of the space station was designated a national laboratory. This laboratory, managed by CASIS, provides funding avenues for companies like NanoRacks to open up research and exploration in space for many more users. One benefit of deploying CubeSats from the space station compared with a rocket is increased opportunity for launch thanks to consistent visits from various cargo resupply vehicles. Further, the launch condition of space station cargo vehicles is not as severe as other rocket launches, since the CubeSats are often launched as part of pressurized cargo. Another benefit is that after these CubeSats have launched to space, astronauts aboard the orbiting outpost can perform quality checks on the hardware to ensure the miniature satellites are not damaged before deploying into space. "This is the beginning of a new era in space commerce," said Manber. "We're helping our customers get a two-year head start in space. They don't have to wait around for a dedicated launch to space but can instead catch the next rocket to space station." One of the new CubeSats deploying through the NanoRacks program is SkyCube, developed by Southern Stars Group LLC of San Francisco. The primary goal of SkyCube is to "provide cutting edge outreach and use communications channels that the public use every day," explained Tim DeBenedictis, founder and owner of Southern Stars. 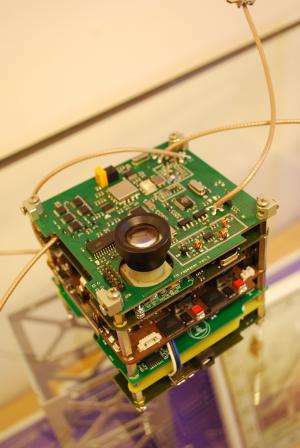 SkyCube is the first CubeSat to use a smartphone application to interact directly with the public. Southern Stars used its expertise in creating planetarium software to develop an inexpensive, accessible and easy but fun phone interface to communicate with SkyCube. The smartphone application, Satellite Safari, will be used to track SkyCube, provide updates on its mission and tweet messages from the public. A Twitter handle will communicate exactly what the satellite is broadcasting from space once it is on orbit. "We also want to send a positive message to end our mission cleanly," said DeBenedictis. To that end, SkyCube will be the first CubeSat to de-orbit itself using a balloon. The de-orbit of SkyCube will occur 90 days into its mission, when the seven-foot diameter balloon will inflate. Because of its size, it will be possible to see it with the naked-eye. Satellite Safari will help direct people where to look in the sky, with the goal of creating an unforgettable moment to inspire children and adults alike to become interested in space and the science, technology, engineering and mathematics (STEM) disciplines. 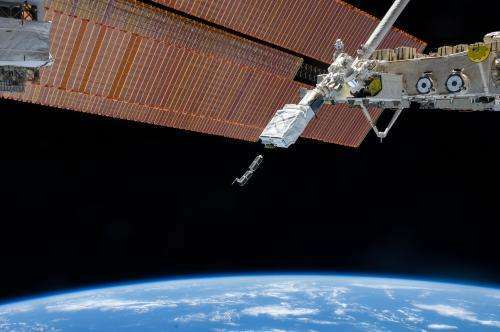 Another CubeSat, ArduSat-2, built and operated by NanoSatisfi of San Francisco, is an improvement upon software and hardware on ArduSat-1, which deployed from the space station in November 2013. ArduSat-2 also will use a NanoRacks deployer to send it off on its mission to test advanced electronics and hardware in the space environment that are only minimally adapted from their Earth configuration. This will help determine potential commercial applications for small satellite data collection and commercial, off-the-shelf electronics. A goal of the ArduSat-2 mission is to contribute to technological information that helps lower the cost of space applications that use low-Earth observation techniques. Both ArduSat-2 and SkyCube used crowdsourcing methods for funding to have direct public involvement in their small satellite missions. "It is the perfect way to test public response," said Peter Platzer, founder and CEO of NanoSatisfi. "The response has been overwhelmingly positive, and we are blown away by the interest in our ArduSat satellites." As ArduSat-2 tests technology to lower the cost of access to space, NanoSatisfi also seeks to continue small satellite missions that capture the imagination of students to advance educational space programs and promote student interest in STEM. LituanicaSAT-1 and LitSat-1 are two Lithuanian satellites scheduled for release this month using NanoRacks' deployers. LituanicaSAT-1 is the first Lithuanian satellite mission to transmit a Lithuanian message from space. LituanicaSAT-1 also will conduct technology experiments such as FM voice repeater operation, taking pictures of Earth and testing various controllers and sensors in microgravity. The data collected by the small satellite will be used to asses satellite health, attitude, operational modes and verify environmental and dynamic simulations used during the design phase. The downlinked data will be open for public use. "We want to involve the whole nation," said Chief Engineer Laurynas Maciulis. "The first Lithuanian message to be transmitted from space will be a salutation from the Lithuanian president to all Lithuanians around the world." A YouTube channel, a Facebook site, media outreach and school visits will help connect Lithuanian citizens, both in their country and abroad, to the historic LituanicaSat-1 event.